Today is March 1, which means there are 33 days until WrestleMania 33 on April 2. It also means that it’s the perfect time to start a daily countdown here on TJRWrestling as I look back at the 33 Greatest Matches in WrestleMania History. Before I get to the first match in the countdown, let me just say that it’s very difficult to order something like this. Thankfully, I reviewed every WrestleMania back in 2012 and have all of them posted in an archive right here on TJRWrestling if you ever want to see my review of any match. Last year, I wrote a list of the greatest 32 WrestleMania matches and I may hold true to that article in the same order. I’m not going to link to that article because it would give it away. Plus, the write-ups in that article are very brief, like 300 words about each match. It’s not easy to rank the matches because there have been over 300 of them. The most famous match of them all was Hulk Hogan vs. Andre the Giant at WrestleMania, but I can tell you that it’s not going to make my list. I’m going for quality here. It was boring, yet it can be argued it was the most important match in WWE history as well. In this daily series, what I plan on doing is talking about the build to the match, give you the full play by play of the match, the analysis of the match, what I thought at the time of the match at the time and what I thought about it when I watched it today. This column is dedicated to my good friend Tom Briggs, who was a big part of TJRWrestling and helped design. He died in a car accident two years ago today. I love you buddy and miss you very much. Let’s begin with match #33. There were a lack of top heels in WWE as they headed to WrestleMania 6 in 1990. Due to the lack of options on the heel side, I think Vince McMahon felt like he had to do something different at WrestleMania by having the babyface champion (Hulk Hogan) face a babyface challenger in the Ultimate Warrior. On the excellent Bruce Prichard “Something to Wrestle With” Podcast covering WrestleMania 6, he told a story about how this really wasn’t a title vs. title match. Vince McMahon said it was “Champion vs. Champion” and that the Intercontinental Title wasn’t on the line. If Warrior won, then that meant he would be the WWE Champion while giving up the Intercontinental Championship. If Hogan won, he would still be the WWE Champion. They set up the match by announcing it a few months before Wrestlemania. They had a memorable moment at the 1990 Royal Rumble. When they had that staredown, everybody was on their feet and the crowd was so loud. Hogan ended up eliminating Warrior during the Rumble and Hogan won the Rumble even though he was already the WWE Champion. It would have made more sense to have Warrior win the Rumble, but WWE was all about putting Hogan over at that point. It was a huge match in 1990. One of the biggest matches ever. I was about nine years old and watched it with a lot of my cousins because everybody was into WWE in those days. I can remember rooting for Warrior just because I thought it was so cool with the face paint as well as the energy he had. I’m sure I dressed up like him at Halloween one of those years as well. It wasn’t that I hated Hogan. We just wanted somebody else in that spot as the WWE Champion. Did I really believe Warrior was going to win? I’m not sure about that because we were so used to Hogan winning. All I knew is that it was a big deal back then. Huge staredown to start the match. The crowd was screaming during all of it. They shove eachother early, then they do a couple of lockups that each guy wins one time. Then it’s test of strength time. Warrior won the first part of it, putting Hogan on his knees. Hulk fought back. He ended up putting Warrior on his knees, which led to a famous picture that has made its rounds over the internet through the years. That test of strength lasted a few minutes. Hogan tripped him up for a two count. Gorilla busts out his “irresistible force meeting the immovable object” line. They did the criss-cross in the ring. Hogan got a body slam. They criss-crossed again and Warrior got a slam. Warrior hit a clothesline to send Hulk out to the floor. Hogan was limping on the floor, so Warrior broke the count and kicked him in the knee a few times. Hogan tells the ref that he blew his knee out. Warrior rolls him back in. They eye rake eachother multiple teams. Hogan fights back, no longer selling the knee. Hulk hit a clothesline in the corner and then the ten punches to the head of Warrior. Hulk hits a couple of elbow drops for two. Gorilla tries to say that his knee popped back into place. Good way to say that Hulk stopped selling it. Hulk nailed him with a clothesline for two. The crowd is loud for everything. It reminds me of WrestleMania 3 in a lot of ways. Hogan gets a backbreaker for two followed by a chinlock. Back up, Hogan hit a backdrop suplex. That’s the most devastating move in his arsenal. Back to the chinlock. A minute later, Warrior fights back with some elbows to the gut. They do the double clothesline spot, which puts both guys down on the mat. The ref counts both guys down in the middle of the ring. Jesse thinks it will be a double countout. Most sane people disagree. The crowd is going wild simply for the two guys laying on their back. Warrior’s face paint is pretty much gone now as he’s the first one to sit up. Warrior shakes ropes to feel the power of his Warriors. Hogan attacks him, but Warrior doesn’t feel any of it. He puts him down with punches and a couple of clotheslines. He hits another clothesline. Warrior whipped him into two turnbuckles, which put Hogan down. Warrior hit a vertical suplex for two. I think that’s his most impressive wrestling move. Warrior puts him in the bearhug. It’s a three minute bearhug. Hulk fights out of it with punches to the face. Warrior runs the ropes, Hogan drops down and Warrior goes crashing into the ref. Warrior goes to the top rope. He hits a double axe to the head. He hits another double axe to the head. Warrior charges in for his flying shoulderblock, but Hogan avoids it. Hogan covers, but there’s no ref. Hogan slaps the mat three times to tell us that should have been it. Warrior gets back up and hits a back suplex on Hogan. Still no ref. He slaps the mat three times. Slowly, the ref gets back into it, he counts the pinfall one…two…and no…Hogan got his shoulder up. That was an awesome nearfall. Hogan hit a shot to the eye followed by a rollup for two of his own because the ref was out of position. The announcers are yelling because it’s so loud in the building. Hogan hits a back elbow to send Warrior out of the ring. Hogan gives him a headbutt. Warrior recovers first and throws Hogan into the steel post. Back in, Warrior hits a clothesline. Gorilla Press time, but he doesn’t have a good grip or maybe Hulk’s too big. He drops him down and follows it up with a splash onto the back of Hogan. He rolls him over. I remember as a kid thinking this was it, but when you watch it a bunch of times you can see Hulk put his hands in position to where he can shove Warrior off easily. At the count of two, Hulk shoves him off. It’s Hulk Up time. Warrior throws punches, Hulk gets back to his feet and points his finger in the face of the Warrior. YOU! Punches to the face are followed by the big boot. The Hogan legdrop misses. What? It missed. I can remember freaking out at that point. That legdrop never missed. Warrior hits the big splash. One…two…three. Hogan kicked out right as the hand of ref Earl Hebner hit the mat. He wasn’t going to lay down for more than three. Warrior wins at 22:47. Post match, Warrior celebrated like crazy and the crowd went wild for him. Hogan dropped to his knees and pointed up at the sky. Hogan grabbed the World Heavyweight Title. He gave it to Warrior. Then they embraced in the ring. Gorilla busted out the famous line: “The Hulkster has just taken one giant step towards immortality.” Hulk left. Warrior celebrated. The announcers put over Hulk Hogan after the match saying they believed Hulkamania would live forever. It was smart. Warrior won, but Hogan didn’t look like a loser because it was done in a way where they both looked strong. Analysis: **** (out of five stars) I loved it when it happened. I love it today. Neither of these guys is going to be considered a great in-ring performer, but they really delivered an above average match here. They booked it in a way where it came off like an even match. Each guy had their moments of strength. Each guy was also pinned without the ref being up. Hogan went for his big move, he missed it and Warrior capitalized to win the match…barely. I like it. It felt like a heavyweight boxing match featuring two men at the top of their game going toe to toe. My complaints were that some of the spots like the test of strength and bearhug went a little too long, but it’s not like they lost the crowd. Over the years, the word came out that the mastermind behind the match was Pat Patterson, who was a key Vince McMahon associate in this era. Apparently, he intricately booked the match with both guys by planning literally every spot. This was the best WrestleMania match of Hogan’s illustrious career as the unquestionable top guy (I gave WM5 vs. Savage a rating of ***1/4). It’s only the second best match in Warrior’s career because the best one would happen a year later. For as much as I may criticize Hogan & Warrior even to this day for a lot of questionable things they’ve said and done in their lives, I give them a lot of credit for delivering a great match on the grandest stage of them all. In my original review I had it at ***3/4 and decided to bump it up 1/4 star, so everything in the top 33 will be four stars out of five and above. 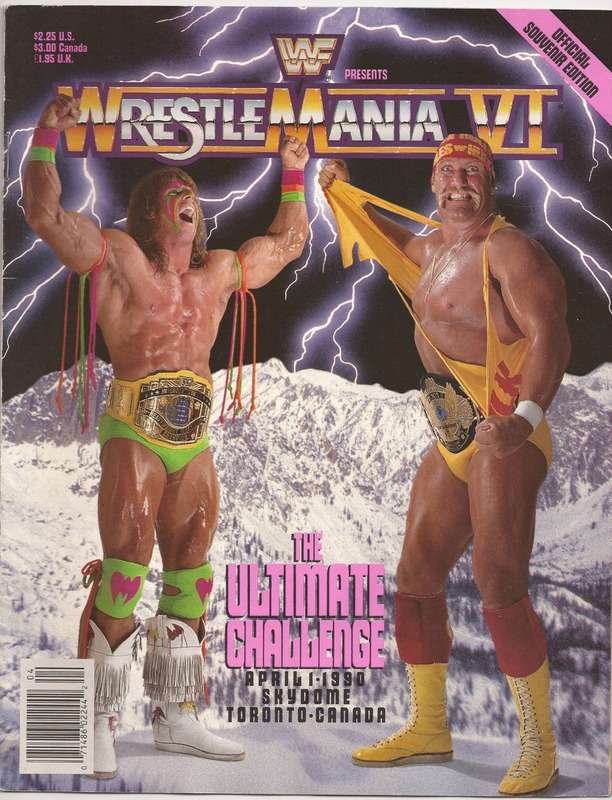 You can read a full review of WrestleMania 6 right here. I tried finding some Hogan comments, but it was difficult. I know he wrote multiple books. I’m not a Hogan fan and have no interest in reading them. This is one of those matches where I’ll probably get feedback from people saying this match should be higher ranked. That’s because when a lot of us watched this match we were kids, we remember it as a big deal and we hold it in high regard because of that. I’m not denying its greatness by placing it in the #33 spot. If this was a list about the most important matches in WrestleMania history it would have been in the top ten. That’s not what it’s about. To the credit of both men, as well as Pat Patterson, who helped put it together, they had a better match than most people were expecting. Neither man was really known for match quality. Back in the 1980s and early 1990s it wasn’t always about that. It was more about being larger than life characters that people paid to see, which both guys were. Warrior held the WWE Title until the 1991 Royal Rumble. Business wasn’t great on top, so the decision was made for him to drop the title to heel Iraqi sympathizer Sgt. Slaughter at that show (thanks to interference from Randy Savage) and Hogan won back the WWE Title at WrestleMania 7. In other words, Warrior’s run on top wasn’t that successful. Some might call it a failure because his run as a top guy lasted a lot shorter than WWE likely expected. There was no Hogan vs. Warrior rematch in WWE. It happened in WCW at Halloween Havoc 1998. The match was awful, which is another reason why the WrestleMania 6 match is so special. I think WWE made a mistake by not doing another Hogan vs. Warrior match. It could have been huge. The problem was that Hogan took time off at various points due to acting roles while Warrior was hired and fired a bunch of times because he of drug issues as well as complaints about money. A rematch would have drawn huge money for WWE if they did it right. It was fun to watch the match again and reflect back on the things that made it special. Hogan may be the best wrestler ever in terms of getting a crowd to react to everything he did even when it was the most basic thing. Warrior had the crowd firmly behind him too, but he was more of a raw athlete that didn’t have a great grasp for the little things that built up a match. For this match, though, they got it right. If you want more information about this match and WrestleMania itself I highly recommend the Bruce Prichard “Something to Wrestle With” Podcast covering WrestleMania 6. I listened to it within the last week. There’s a lot of great info there provided by Bruce because he was a key figure backstage in WWE during those days, so he provided us with the kind of insight that nobody else has done before. Prichard explained that even though it was a big match, it wasn’t as much of a financial success as you might have thought. I’ll be back tomorrow with match #32 on the countdown.